Romanian tennis fans have yet again been regaled with Romanian tennis players' satisfactory run in recent competitions. 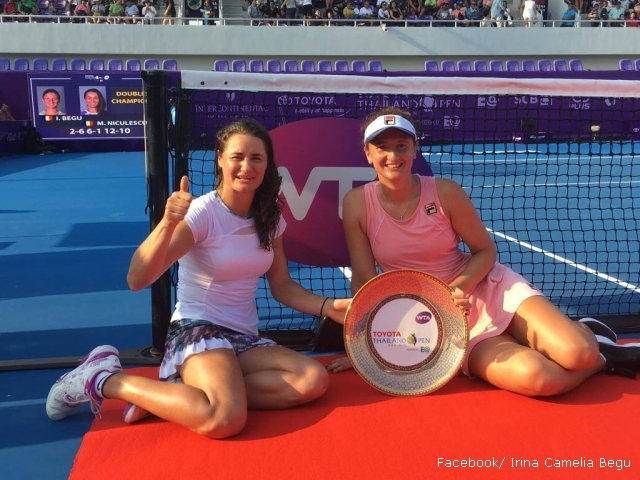 Last week in Thailand's Hua Hin, Irina Begu and Monica Niculescu won the Toyota Thailand Open. In the first 2019 WTA title won by Romanian tennis players, Begu and Niculescu succeeded a 2-6, 6-1 and 12-10 super tie-break win against the Russian-Chinese pair made of Ana Blinkova and Yafan Wang Reason enough for Radio Romania International to designate Irina Begu and Monica Niculescu the Athletes of the week. Irina Begu was born in Bucharest on August 26, 1990. In 2006 Begu succeeded her first noteworthy performance, winning the European title in the under-16 category. Irina Begu's record includes four WTA singles titles she won in Tashkent, in 2012, in Seoul, in 2015, in Florianopolis in 2016 and in Bucharest, in 2017. In the women's doubles, Irina's record includes nine professional circuit wins. According to the WTA rankings, Irina Begu is 75th and 35th-placed in the doubles and singles, respectively. Monica Niculescu was born in Slatina, southern Romania, on September 25th, 1987. She has been living in Bucharest ever since she was 4. Monica took up tennis at the age of five and turned pro in 2002. Niculescu's career best according to the WTA women's singles rankings occurred in February 2012, when she was 28th-placed. According to women's doubles rankings, Monica Niculescu climbed as high as the 11th-position, in April 2016. At present Monica Niculescu is 106th and 51st-placed, in the singles and doubles classification, respectively. The win in Thailand was the third WTA title jointly won by Irina Begu and Monica Niculescu, after the 2012 title in Hobart. As a competing pair, in the recent past Niculescu and Begu won three other titles, in Luxembourg in 2012 and in Wuhan and Moscow, in 2015.